The map areas are those depicted in Wainwright's Pictorial Guides. 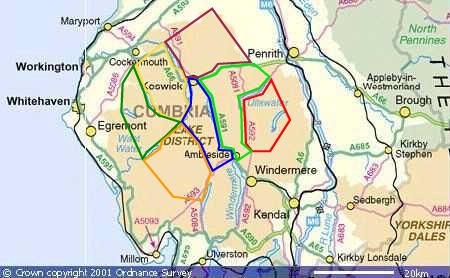 The Synges are Lake District hills listed in The Lakeland Summits: Survey of the Fells of the Lake District National Park by Timothy Synge. (Synges can be found by searching on Class=Sy on this website). The Synges list includes Pillar Rock which cannot be ascended without rock climbing equipment - click on the link for details of a route of ascent.